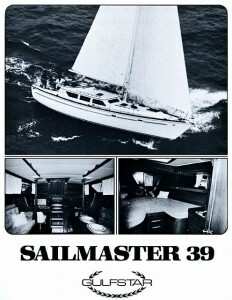 When introduced in 1981, the Gulfstar 39 Sailmaster was a controversial design because of her single stateroom interior layout. Most aft cockpit sailboats of her day featured a quarter berth. These days you often see twin berths aft as manufacturers maximize sleeping accommodations. From a sailor’s perspective the G39’s accommodations make a good deal of sense. Quarterberths tend to turn into garages packed with all sorts of useless cruising junk. The elimination of that area forces you to keep a tidy ship. And as everyone finds out the best sleeping berths are at the center of yaw, pitch, and roll — the salon settees. In 1982, Gulfstar introduced a Mark II version with a portside quarter berth instead of the office area and deep cockpit locker. 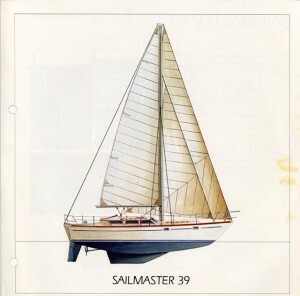 According to the Gulfstar Owner’s Club, all told they produced around 60 hulls (some cite 57 hulls) of the Sailmaster 39 over the two year production run. 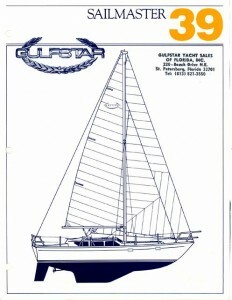 Then using the same hull as the 39SM but with a center cockpit arrangement, Gulfstar made a dozen Moorings charter boats and branded them Gulfstar 40 Sailmasters. Let’s take a look at the features of this well respected model. Like her Sailmaster sisters, the 39 has large doghouse windows which distinguish her dockside profile. Vince Lazzara’s son, Richard C. Lazzara, designed her and did an excellent job balancing performance and liveability. The family now builds Lazzara megayachts over in Saint Petersburg after selling the assets of Gulfstar to Viking Yachts in the 1990. Her 4′ 9″ draft allows her to access anywhere in the Bahamas and eastern Keys without fear while her 53′ 5″ bridge clearance allows the crew to motor up the Intra-coastal when foul weather slops up the sea. She has two portholes in her topsides on each side providing even more light inside. Her raked bow leads to a slight sheer and flat transom aft. Underneath she features a long fin keel and skeg hung rudder arrangement. 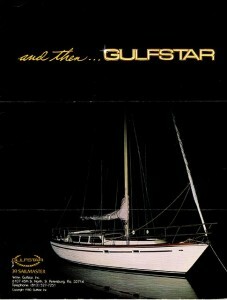 The Gulfstar 39 was built during Gulfstar’s golden era and has top quality construction. Many times clients unduly worry about Gulfstar because of the inexpensive yachts they mass produced during the early 1970’s and their charter boats of the late 1980’s. During the late 1970’s and early 1980’s, their yachts rivalled the finest in the world. For example they patented a special process to camber corners on interior woodwork. They switched from Formica to teak interiors, iron to lead ballast. Above and below, the 39 has flawless glasswork, gorgeous teak appointments, and high quality hardware. The hull has balsa cored topsides and deck, encapsulated lead ballast of 8,200 pounds, and a 53′ tall keel stepped mast. On paper, her ballast to displacement ratio is an impressive 43%. The biggest and most common owner complaint is of leaks around the doghouse windows and portholes. The original ports and hatches were aluminium ones by Atkins and Doyle. Carefully inspect the veneer for water damage. It is not an easy job to match the exact shade of Gulfstar’s dark teak veneer. A second item of note is the blister pox of the 1980’s which hit all US manufacturers including Gulfstar. The bow has good space where you could stow your dinghy. Then the cabin trunk rises with a centerline hatch and two stainless dorades. Teak handrails with give you security when in your safety harness and going forward in a blow. Teak eyebrows decorate her trunk lines. Two more hatches populate the coach roof where the mid-boom sheeting traveller sits. Here tall stanchions keep you on deck. In the aft cockpit, she has wide teak combings, a centerline pedestal, and cockpit table. The benches are long enough to lay down along while the helm is fully aft. Down below bathed in dark teak is a light and airy interior. Both the single stateroom and quarterberth layouts have an aft facing navigation station starboardside, an L-shaped dinette, and a straight settee before the sole steps down. There is a unique pantry underneath the step down which hydraulic raises for dry good storage. The settees pull out to make double berths for people who like each other. Forward is the galley along the portside, the starboard master head, and finally V-berth forward. The forward galley is an unusual feature and opens up the salon. Chainlocker access is available through the forepeak. The single head has a separate stall shower, one of those sometimes overlooked features that is important for cruising comfort. The interior does seem to be that of a larger yacht. Storage is everywhere. The single stateroom version has a handy office area portside while Mark II versions have the previously mentioned quarter berth arrangement. You will be amazed how handholds are where ever you need them. We don’t put many miles on this boat. The Perkins 4-108 has just over 1200 hrs. and has only had fuel and oil servicing. The helm balances very well — on the wind (10-20K) we can leave it alone if the seas aren’t up. I rarely put in a reef because the winds are seldom above 15-20K here on Puget Sound in the summer. It’s tough to get the rail in the water without starting to worry about the sails but I have done it on Lake Washington — knotmeter hit 9.6 which was probably pretty close. We power at 2000-2200 RPM at 6.2 to 6.8 K, no wind, with a three-blade, 18″ prop. The Gulfstar 39 is from the golden era of Gulfstar with her solid layup, beautiful teak craftsmanship, and solid performance. They made quite a few during the two years of construction, so there is usually one of two available on the brokerage market. Previous sales show valuations maxing out at $100,000. The 39 is a sweet boat and would be an excellent choice for a cruising couple.